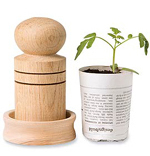 Old Friends, Yellow Tomatoes and Salsa! My tomatoes didn't perform as well as I had hoped this year. We had plenty to eat fresh, but not enough to freeze or can any. There just weren't many tomatoes on each plant. I'll admit that I grew too many different heirloom varieties with too few plants of any one kind. There were never very many tomatoes of the same kind ripe at any given time. 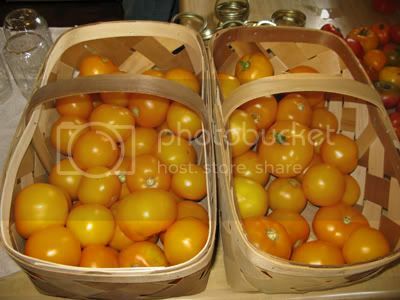 They were organically grown, and as you can see from the picture, they were yellow tomatoes. Could we still make salsa without red tomatoes? We were up to the challenge. These friends are a generation older than me and were neighbors of mine growing up. More summer days as a boy were spent playing on their farm than at my own house, so it was great talking with them and catching up on how each other's families were doing. I think their gardens were the first I ever saw as a youngster. What used to be an acre or more of vegetables is now just a small plot, but they are still better gardeners with that tiny garden than I am with a larger one. Their 6 tomato plants produced far more than my 30 plants! That is a bit humbling for me, but I was so glad to get to see them (and glad to get the tomatoes!) We said our goodbyes and headed home to process the tomatoes! It was getting late in the day already, so the whole family pitched in to make to work go faster. 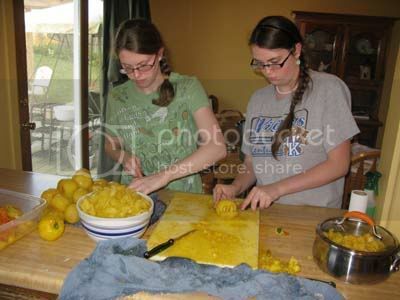 My daughters did a great job getting the skins off the tomatoes and cutting them up. 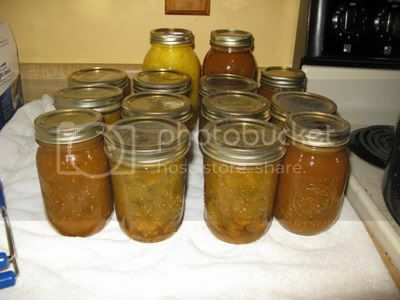 Renee and I mixed their bright yellow tomatoes in a large pot with the other salsa ingredients. It instantly smelled delicious. It didn't look quite as appetizing. The other ingredients changed the color to an orange-brown. We canned 10 pints of this odd salsa as well as a few pints and a few quarts of yellow spaghetti sauce, which looked equally as strange. 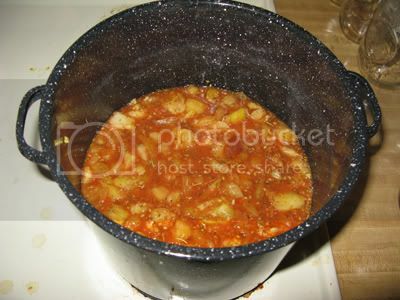 The only thing that didn't look odd was one quart of plain tomatoes that we will use in chili. 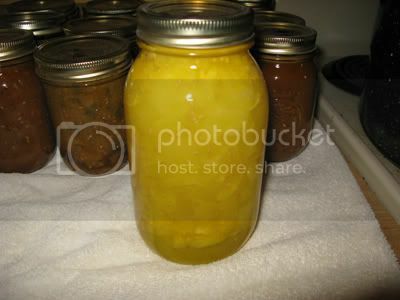 That jar looked fairly pretty, but more resembled canned peaches than tomatoes. I wish we could have canned more of the plain tomatoes - now I'm sounding greedy. It was quite a blessing to get these tomatoes in the first place, and to get to visit with the farmers who grew them. By the way, although it looks odd, the salsa tastes great! 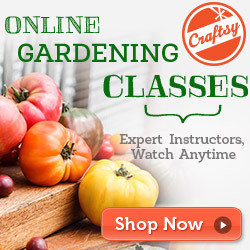 With Fall almost here, there is not as much to harvest in the garden right now. 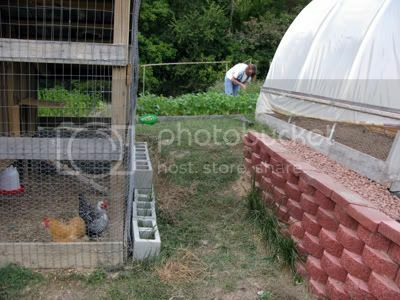 But if you walk up the path between the chicken coop and the greenhouse, the first bed you come to is the green beans. 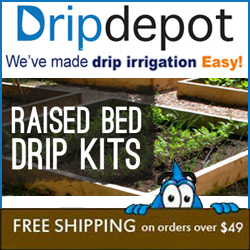 This bed gave us lettuce in early spring and then early potatoes in summer. The third planting was green beans, and now they are ready! My wife and I picked a heaping bowl full of them. She also picked some late tomatoes. I only found one ripe tomato from my topsy turvy. When I carried it in with the beans, it looked like a green bean sundae! 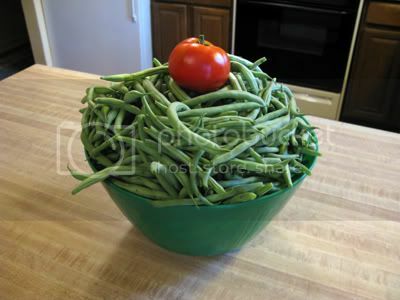 With this heaping bowl of beans, we froze 5 quarts and made 5 pints of Dilly Beans. 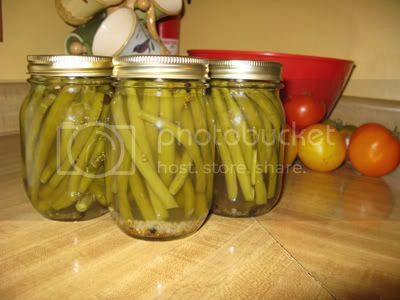 We have never tried pickled green beans before, so we only made a small batch. If we like them enough, we will make a lot more next summer. 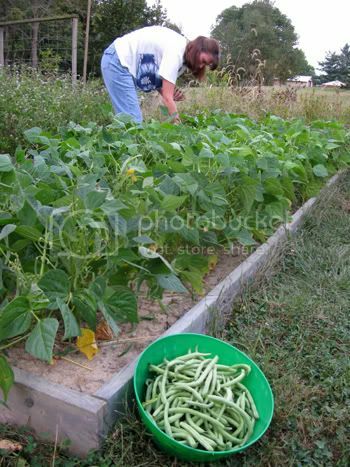 Since green beans are probably the easiest thing to grow in the garden, I don't know why I don't plant more. Next year!